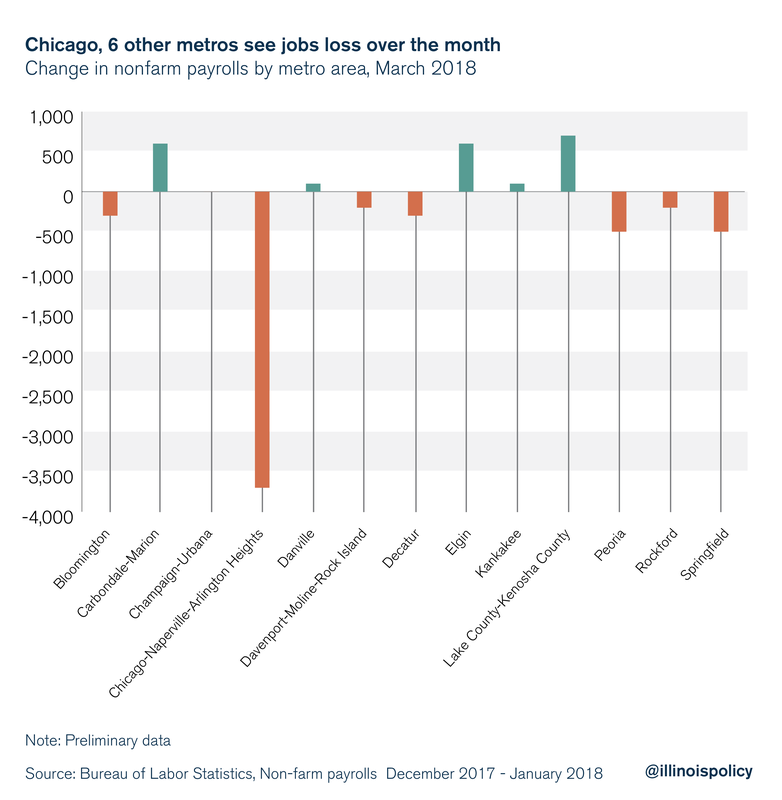 Despite large over-the-year employment gains reported by the Illinois Department of Employment Security, Illinois’ metropolitan areas combined to shed 3,600 jobs in March. Seven metropolitan areas lost jobs over the month, with Chicago leading the way, dropping 3,700 jobs. Following Chicago, Springfield shed 500 jobs (-0.4 percent); Peoria dropped 500 jobs (-0.3 percent); Decatur lost 300 jobs (-0.6 percent); Bloomington payrolls declined by 300 (-0.3 percent); Rockford dropped 200 jobs (-0.1 percent); and Davenport-Moline-Rock Island shed 200 jobs (-0.1 percent). Champaign-Urbana payrolls saw no change. Fortunately, some areas of the Prairie State increased payrolls over the month. Lake-Kenosha County gained 700 jobs (+0.2 percent); Carbondale payrolls increased by 600 (+1.1 percent); Elgin added 600 jobs (+0.2 percent); Danville gained 100 jobs (+0.4 percent); and Kankakee added 100 jobs (+0.2 percent). Although some areas experienced growth during the month of March, on net employment declined. Particularly concerning is the dip in Chicago area payrolls, as Chicago has been a catalyst in Illinois’ job recovery. All metro areas reported an over-the-year decline in the unemployment rate for both February and March. Although metro level labor force data is not yet available for March, February data reveal the declining unemployment rate from February 2017 to February 2018 was not solely caused by jobs gains in all metro areas. 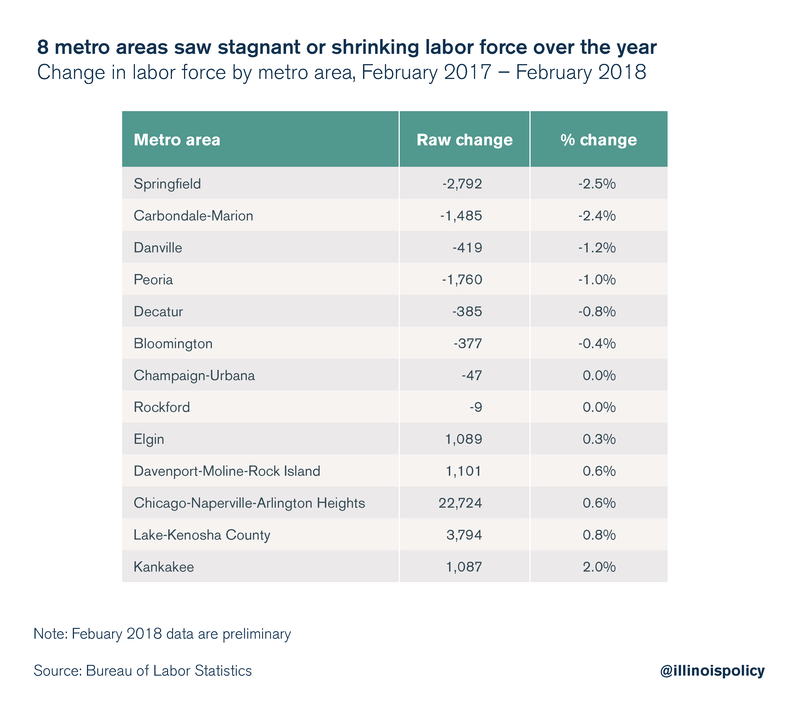 Bloomington, Carbondale-Marion, Champaign-Urbana, Danville, Decatur, Peoria, Rockford, and Springfield all experienced shrinking or stagnant labor forces over the year. Even worse, the declining unemployment rate in Carbondale-Marion and Springfield stemmed entirely from the shrinking labor force, as these areas also lost jobs over the year. Despite employment gains, declining labor forces across the state are cause for concern. Improving Illinois’ labor market requires signaling in Springfield that Illinois is once again open for business. Adopting a spending cap to provide the assurance that lawmakers won’t hike taxes each year is one way to restore confidence and to improve the business climate. Instead of continuously hiking taxes, state lawmakers need to free Illinoisans from their enormous tax burden. A lower tax burden would stimulate investment and job creation, making the state a more attractive place for families and businesses to plant roots. In addition to providing a path toward tax relief, a spending cap would be a strong signal to creditors that Illinois wants to get its finances in order, thus potentially improving the state’s worst-in-the-nation credit rating. If state lawmakers could only do what many households manage every day – to spend within their means – they would soon see more investment flowing into the state to spur job creation and economic growth.